Jaydeep Steels produces and supplies, a wide range of high-quality Brass Bars & Rods that are used for applications like locks, gears, bearings, doorknobs, ammunition casings, and valves, for plumbing and electrical applications, etc. These have bright-gold like appearance and hence are used for decorative purposes too. 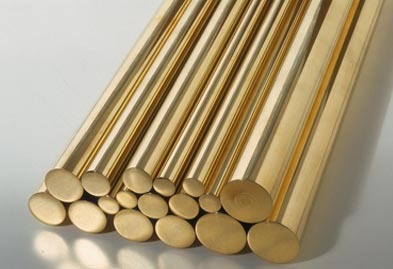 We also manufacture Brass Round Bars that are available in grades like C230, C260, C330 etc. and are used for applications like fasteners, gears, architectural extrusions, etc. 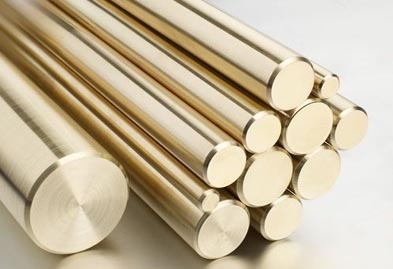 Our brass bars and rods have features like a high degree of dimensional accuracy, excellent pressure tightness, corrosion resistance, high tensile strength, resistance to abrasives, and much more. We manufacture our by Brass Forged Bars & Rods the hot press forging process, to make sure that it has properties like superior density, freedom from flaws, high strength, leak resistance, close tolerances, low overall cost, and much more. The most common use of the Brass Threaded Bars & Rods is in securing parts together in a wide variety of applications like manufacturing, automotive and construction. Brass Bright Bars & Rods are usually produced by one or more cold finishing processes. Our final products are available in forms like threaded, polished, hot rolled, cold rolled, annealed etc. They also have smooth and granule-free. Brass Cold Drawn Bars & Rods have increased yield strength and relieve stress. Their production process is overlooked by numerous experts working at our place. The available shapes include round, square, rectangular, hexagonal, etc. We use the best quality Brass material in making the products, hence serving our customers with only the best products. Contact us today to get the best price quote! Jaydeep Steels stocks a wide range of materials and grades. Below are a list of all standard brass bars and rods materials and grades we stock. Our experienced team of metal experts will get you the metal you need when you need it. Call us today for your Brass Bars & Rods Needs!